Order fulfillment in the ecommerce industry consists of receiving an order, processing it and delivering it to the right customer. Sounds simple, right? Spend a day or few hours within the warehouse of an ecommerce retailer and you will know it is anything but simple! An order fulfillment partner can be engaged for specific regions or for a given period of time. Depending on the volume of orders, this can be further scaled to include additional locations or time frame. Their large capacity of resources ensures that an ecommerce business is able to scale upward its order fulfillment requirements without having to lock in large sums of money in capital assets. As the scale of order fulfillment ramps up across regions, the outsourcing partner will achieve cost savings through route optimization and proactive delivery planning. The cost savings achieved can be transferred to the ecommerce business. This helps to save costs which can be used to further enhance operations. In an outsourced order fulfillment model, a 3PL vendor handles all your inventory and the infrastructure needed to maintain it on a private basis. Your role is to procure the inventory and deliver it to the 3PL. The end result is a refined and streamlined supply chain process that quickens your order fulfillment, warehousing and product returns process. Outsourcing partners are usually ahead of the herd in terms of technology adoption. They typically invest in the latest ERP systems and inventory management software to help manage the entire order management process with ease. For an ecommerce store that is just growing, investing in such systems could prove to be expensive and time-consuming. Thanks to order fulfillment outsourcing, they can have the best of both worlds. If you are going to handle the fulfillment on your own, here are a list of resources you would need. You will need a supply chain management software, warehouse space to store inventory, personnel to manage and maintain the warehouse, labor to move the goods and logistic services to deliver the packages. These costs will consume a sizeable chunk of your operational budget. F. Curtis Barry & Company estimates the cost of order fulfillment to net sales to be in the range of 14%. More than cost, the trouble of having to manage order fulfillment meticulously on a day-to-day basis makes outsourcing a better option. 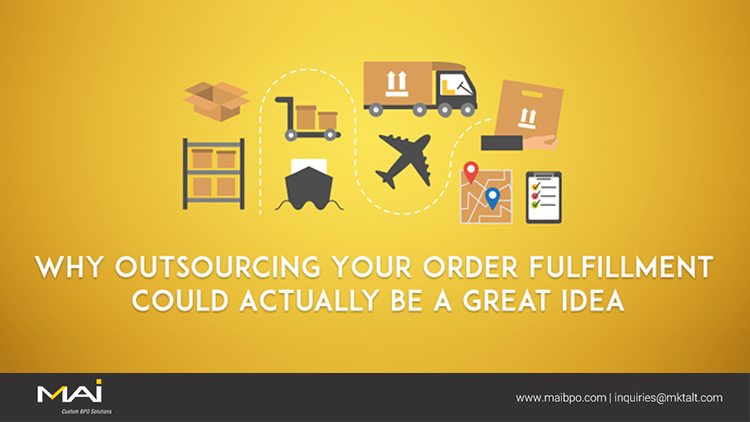 Outsourcing order fulfillment will save you effort while also leaving you more time to focus on other priorities. Outsourcing your fulfillment process can give you the benefit of maintaining the quality of packing. From deciding what filler material to use to figuring out the box best suited for an order, an outsourcing agent will take care of packing and dispatching your orders in the right fashion. Outsourcing the order fulfillment process can bring several benefits to eCommerce players. As customer expectations touch new heights, you will need a reliable partner who can help your business function efficiently and stay competitive.